Accessible recreational opportunities are available on Fort Drum. 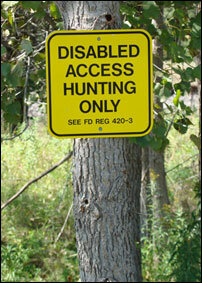 Hunters eligible for accessible accommodations in paragraphs include: hunters possessing a New York State Non-Ambulatory Hunter Permit; persons with severe permanent disabilities eligible for a New York State Parking Permit or License Plate; or persons with a life-threatening illness participating through a non-profit organization. Hunters that desire accessible accommodations must contact Fort Drum's Natural Resources Branch (315-772-9636 or Raymond.E.Rainbolt.civ@mail.mil) to provide appropriate paperwork and be validated in the iSportsman system. See the NYSDEC web site for more information about accessible recreation opportunities in New York State including fishing, boating, trails, and camping. Hunters eligible for accessible accommodations may hunt from an ATV or POV parked in a sub-training area open to recreational use for that day. Vehicles that are hunted from must be parked off designated recreational roads (reference Fort Drum Recreational Use Map) in such a manner as to not obstruct traffic (i.e., all four wheels off the road), but within 50 feet and visible from the road. ATVs must be transported into the Training Area by vehicle or trailer and must be used in accordance with Fort Drum Regulation 420-3 paragraph 6(j). The transport of weapons must be in accordance with Fort Drum Regulation 420-3 paragraph 7(d); weapons on ATVs must be in a scabbard. The engine of the vehicle must be turned off while hunting, and before the weapon is uncased. Hunting from vehicles must be in accordance with the New York State regulations. Archery hunters must possess a valid New York State Modified Archer Permit or Modified Crossbow Permit to use modified bows per state regulations. One hunting opportunity is at six designated sites in Training Areas 6C and 5E which are otherwise off-limits for recreational opportunities. Hunting is allowed for any game during its respective season at these sites. Only those persons validated in the iSportsman system can check-in for these sites. Other persons can assist in hunting, but they must have a NYS hunting license and Fort Drum Recreation Permit; these person may also hunt at the same time, but may not hunt from a vehicle or ATV and must be in reasonable proximity to the hunter they are assisting. Each site is designated with a post and sign labeled as a "center point." Hunting is allowed within a given distance from that center point. 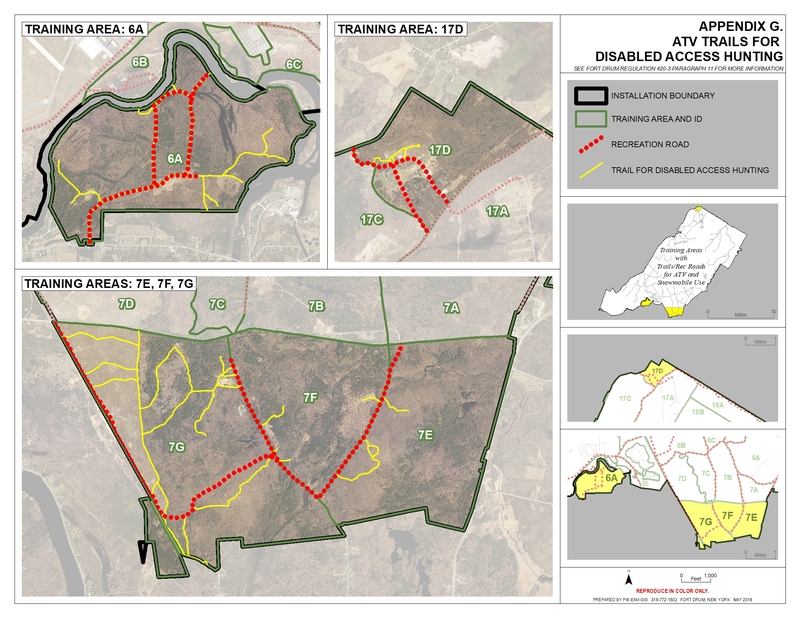 Directions, a description and photos of each site are available in the Disabled Access Hunting on Fort Drum brochure (updated Oct 2018). Another opportunity on Fort Drum is a special waterfowl hunting area with accessible blinds and “waterfowl refuge” on the peninsula at Matoon Creek Marsh off of Matoon Creek Road in Training Area 17B. See the Special Waterfowl Hunting Area page for more information. Hunters may also hunt from an ATV on any trail/road not designated as a recreational road in Training Areas 6A, 7E, 7F, 7G, and 17D open to recreational use for that day. Hunting from vehicles must be in accordance with the New York State regulations. (1) ATVs must be transported into the Training Area by vehicle or trailer which must be parked off designated recreational roads (reference Fort Drum Recreational Use Map) in such a manner as to not obstruct traffic and only next to or within the sub-training area open to recreational use for that day. (2) ATVs must be used in accordance with Fort Drum Regulation 420-3 paragraph 6(j). The engine of the vehicle must be turned off while hunting, and before the weapon is uncased. (3) The transport of weapons must be in accordance with Fort Drum Regulation 420-3 paragraph 7(d); weapons on ATVs must be in a scabbard. The Rodman Landfill in Wildlife Management Unit 6K is a new hunting opportunity for persons possessing a New York State Non-Ambulatory Hunter Permit and/or Soldiers assigned to a Warrior in Transition Unit. The Rodman Landfill is located on NYS Rte. 177 in the Town of Rodman approximately 20 miles south of Fort Drum. See the Development Authority of the North Country (DANC) web site for more information and to download an application. There is one disabled fishing access opportunity at Remington Pond in Fort Drum's Cantonment Area. An accessible path and floating pier is on the east side of the pond near the playground and Cranberry Lake Pavilion. See the NYSDEC web site for a list of fishing access sites listed by county for anglers with disabilities. See the NYSDEC web site for a list of accessible boat launches throughout the NYS. See the NYS Camping Guide for accessible facilities which are noted in each region throughout the guide. An entire campground that is fully accessible is John Dillon Park near Tupper Lake, NY--approximately 100 miles from Fort Drum. Below are links to web sites and contact information for more information. The inclusion of these links should not be considered endorsements by Fort Drum, but are provided for information purposes only.